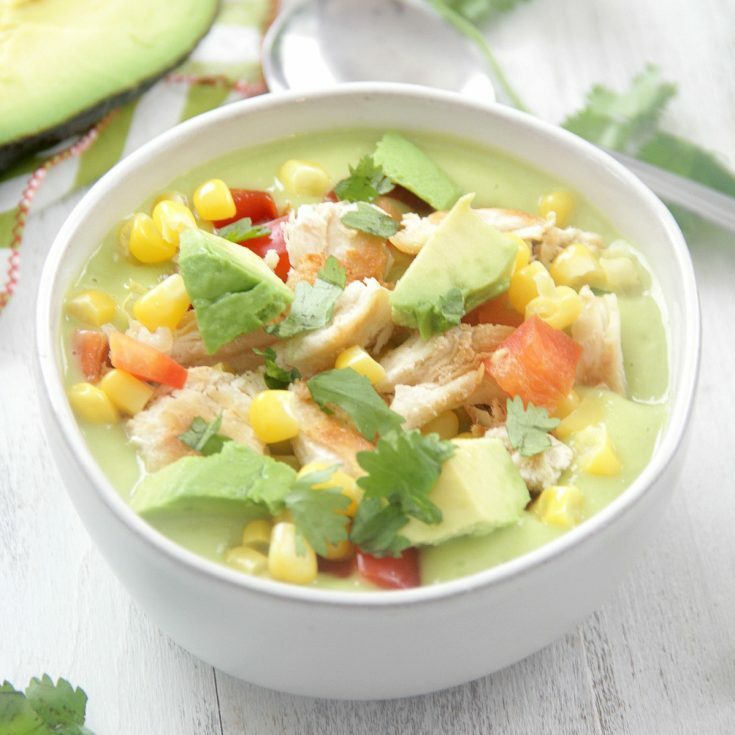 Avocado-Corn Chowder with Chicken - Eat. Drink. Love. Hi friends! Sorry I have been a little MIA the past couple of weeks. We’ve had family in town and I wanted to just take a little break to soak up the precious time! How do you guys feel about chilled soups? I honestly don’t really know how I feel about them. To be honest, it’s hit and miss for me. 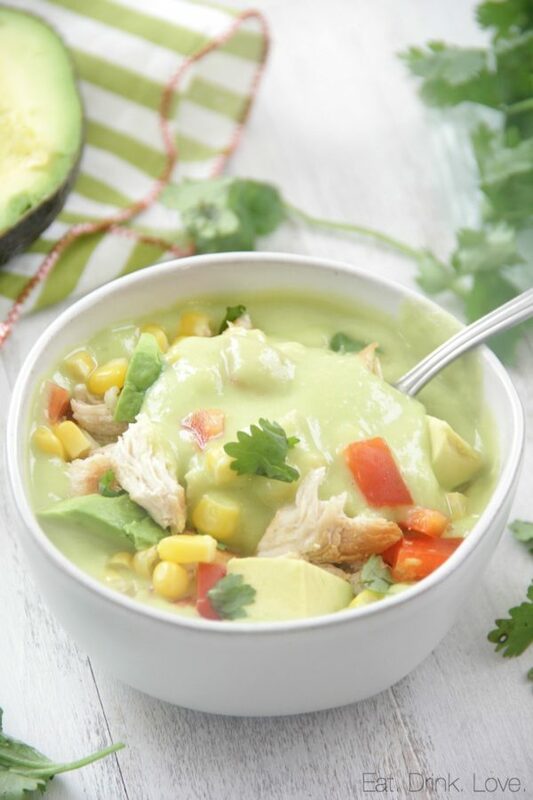 This Avocado-Corn Chowder with Chicken was intended to be served as a chilled soup. I was surprised how much I like this soup chilled, but I also wanted to see what it would taste like warm. I ate half of it cold and half hot. I kind of liked the warm version a little better, but that’s because I normally just prefer warm soups to cold soups. So, I’m going to say you can eat this chilled or warm. 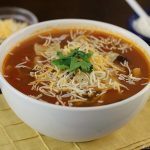 This soup is so very simple and quick to make. I love it for a nice summery lunch, but it’s also the perfect weeknight dinner for when you don’t really want to cook or be in the kitchen for long. 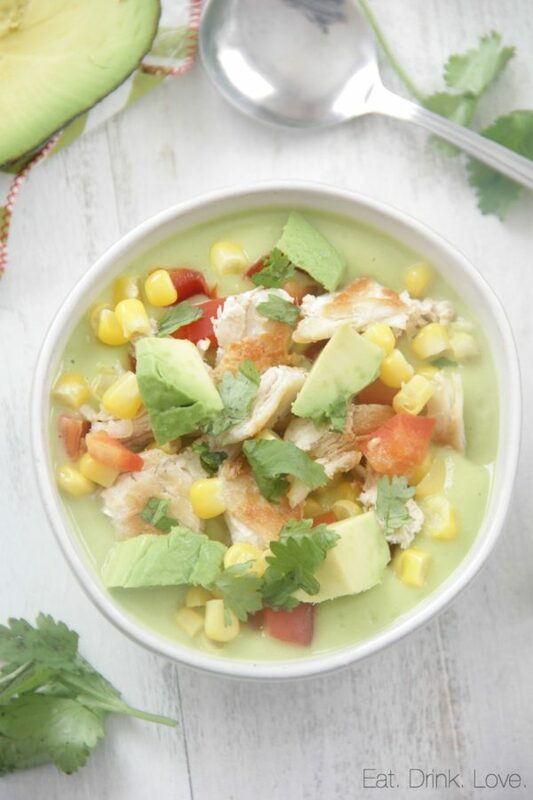 Fresh avocado just gets blended up with some broth and orange juice for light citrus punch. 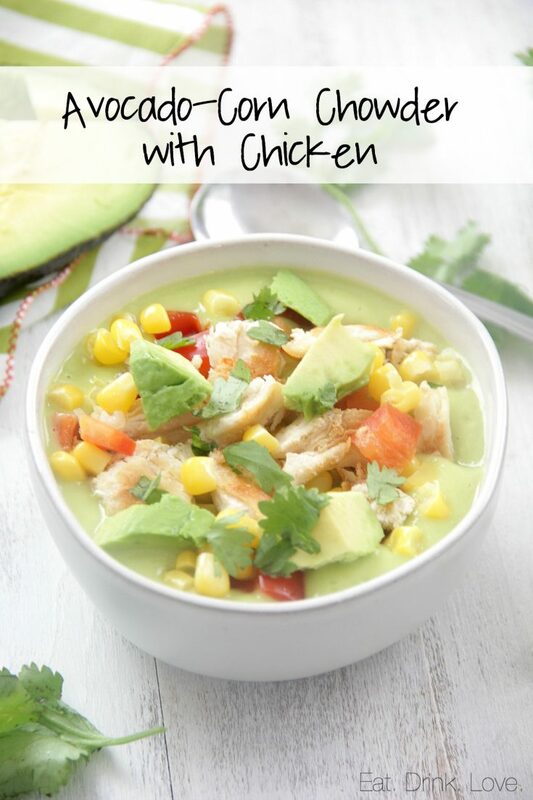 Then you just need to mix in red pepper, corn, grilled chicken, and diced avocado. If you are feeling extra lazy (hey, no judgement from me! 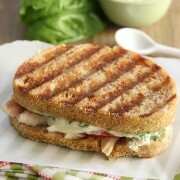 ), you can also skip the grilled chicken part and toss in some rotisserie chicen from your local grocery store! 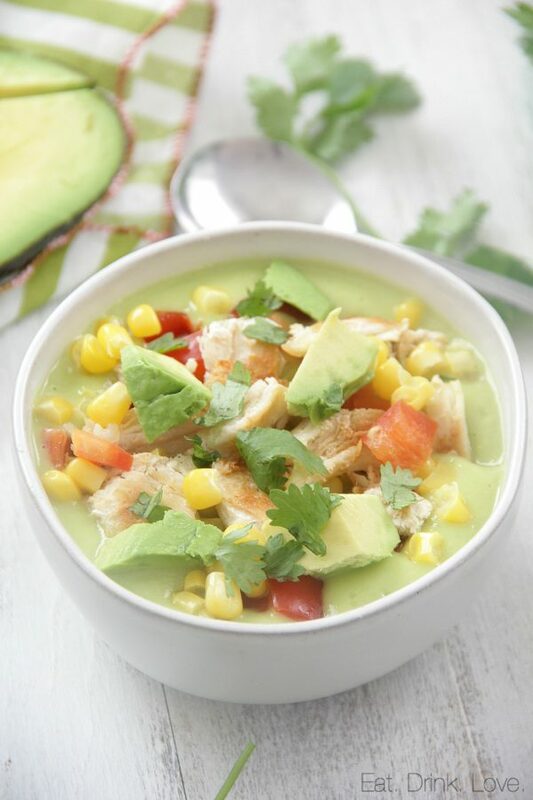 This fresh and hearty chowder is made with avocado, corn, and grilled chicken and can be served chilled or warm! Peel and coarsely chop 1 avocado; place in a blender. Add broth, orange juice, honey, 3/4 teaspoon salt, 1/4 teaspoon black pepper, and red pepper, if desired; blend until smooth. Place in freezer to chill while chicken cooks (you can skip this step if you plan to eat the soup warm). Heat a grill pan over medium-high heat. Brush chicken with oil and sprinkle with remaining 1/4 teaspoon salt and 1/4 teaspoon black pepper. Place chicken in pan and cook for about 4 minutes per each side or thoroughly cooked. Remove chicken from pan and rub chicken with cut sides of garlic halves. Let chicken stand 10 minutes. Slice into bite-sized pieces. Peel and dice remaining avocado. 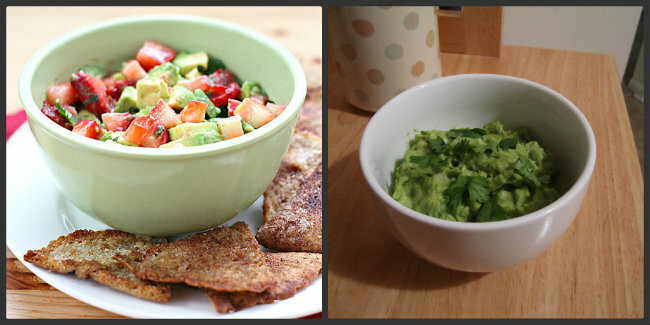 Stir diced avocado, corn, bell pepper, and onions into chilled avocado puree. If you plan to eat the soup warm, transfer to a sauce pan and heat until warm. Spoon chowder into bowls; top with chicken and cilantro. Serve with lime wedges. This looks awesome! I’m with you….I’d try it warm, too. I like Vichyssoise – but I adore it when it’s warm!